I began making jewelry about 20 years ago when my boyfriend noted how much much money I routinely spent buying jewelry and casually mentioned that it might be more economical if I just made my own. I started with a casting class at a local community arts center and from there on I'm pretty much self taught. I like to experiment with new techniques and try new things. Some are more successful than others. Making jewelry went from hobby to obsession when I did a stint working for Anthony Nak in their start-up days. I have nothing but admiration for their work - it is truly divine! But, I quickly realized that I wanted to design my own stuff - not produce someone else's designs. Over the years I've worked a number of jobs in the arts (graphic designer & freelance illustrator)and healthcare (in a psych facility and several large hospitals)to support my obsession with buying shiny colored rocks and making things with them. 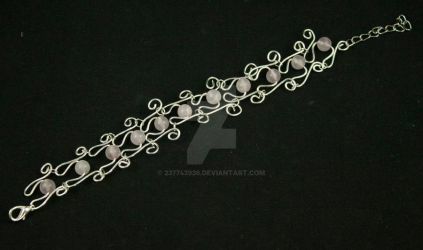 I now have a website at www.echomoonjewelry.com. Check them out if you get a chance. You can also find me on FACEBOOK. Follow me on Twitter. I'm sitting here, swilling my morning coffee, staring at my website stats and pondering the mysteries of abandoned shopping carts. 40 in the last 6 weeks - all abandoned at checkout. First I thought, maybe there's something not functioning correctly with my checkout system. So I bought a pair of earrings from myself just to test it. Seemed to work fine. Now I'm just trying to figure out why and it's driving me batshit crazy. I realize people change their minds and abandon their carts all the time. I've done it myself. Somehow this just seems excessive. I think I need more coffee.